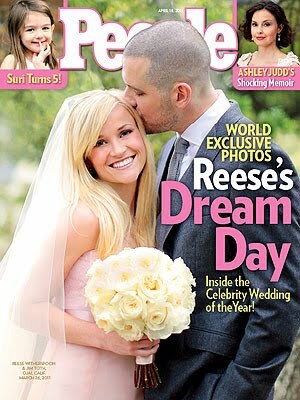 Charleston Girl: What happened to Reese's wedding hair? I mean, some brides look gorgeous with their hair down for their wedding day, and I get that... but it looks like she just woke up, brushed her hair, stuck a veil in it..and that was that. I think her hair would have looked perfect with a simple gown..maybe getting married on the beach... etc. But her dress is beautiful, and she's wearing a veil... why didn't she do anything with her hair? Or if you're going with it down, at least curl it maybe...or pull it half up. 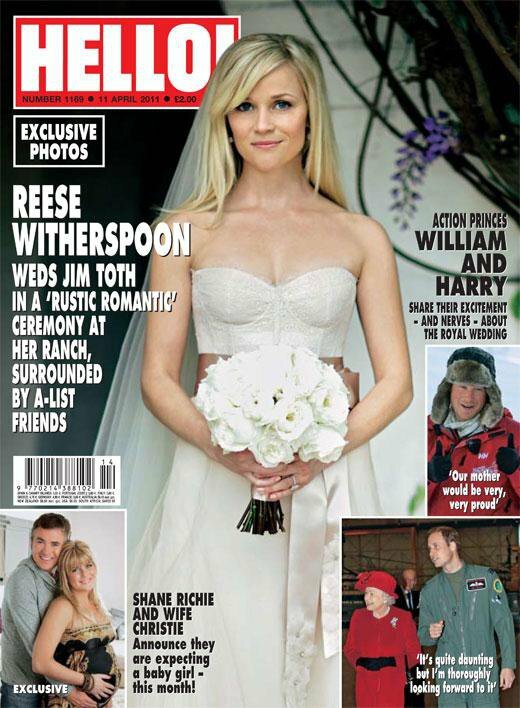 But I guess when you're a mega movie star you can look any way you want on your wedding. But my point is... you're a mega movie star with the money to get your hair done...so why not? Maybe she was just so tired of being all done up for the Oscars and all the other awards shows that she really did just want to brush it and be done with it. Who knows. What do you think? Do you like her wedding hair or are you with me in thinking maybe she should have had something done to it?? Completely agree. Her hair looks amazing in an up-do! She looked gorgeous but you know, I thought the same exact thing! She is beautiful but yes it would have looked better with her hair up. i have to say, i love her hair like that. it's very simple with the rustic wedding they were going for. but she is one that can pull off almost any style. I thought the sammeee thing! When I saw the picture I was like what happened to the soft curls she normally rocks? or the pretty up-dos? go her for trying to switch it up, I don't like that Carrie Underwood wears her hair the EXACT same way, every single time you see her, but this was her wedding... it looked verrry plain!